On 18 April 2017, a first workshop was held at Kaye Academic College of Education in the framework of the PROTEACH project sponsored by Erasmus+. A total of 25 staff members participated in the meeting, among them the president of the college, the head of the Teachers Training School, all program heads of the college, and leading staff members. 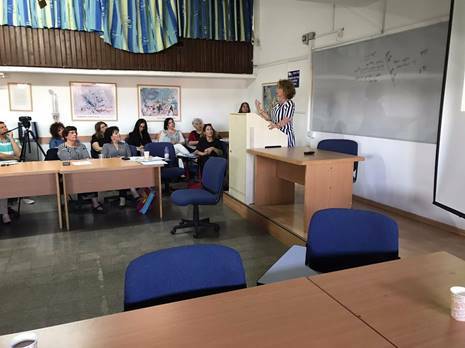 The workshop was presided over collaboratively by the leading staff of the MIT group in the Mekif Vav High School, Beer Sheva (the principal, the educational counsellor and the incubator coordinator) and the staff of Kaye College (the head of the unit, the incubator coordinator and the group moderator). This was the first occasion on which the PROTEACH project was presented, covering the project aims, Kaye College–school collaboration, work processes and present year outcomes. The participants expressed great interest in the project. The discussion focused on PROTEACH guiding principles that could be integrated into the college activities.